The Academy of Ancient Music is one of the world's first period instrument ensembles. Back in 1973, most orchestras played classical music in a modern style. The instruments were different; the pitch was different; the number of players was different; the very essence and spirit of performances was different. But change was in the air. Wouldn’t it be great, people asked, if we could turn the clock back; if we could find out more about composers’ original intentions and get closer to the style in which music was originally performed? This was the spirit in which Christopher Hogwood founded the AAM. AAM was a pioneer in historically-informed Baroque performance; the whole orchestra working together to rediscover sounds which hadn’t been heard for hundreds of years. AAM continue to explore the sound-worlds which inspired Bach, Handel and Haydn. They revel in the expressive power of old instruments - flutes made out of wood, trumpets without valves, strings woven from gut. It’s not just the sound of the music which has changed - AAM performances are full of energy and passion and joy. Pergolesi’s beautiful Stabat Mater is his best-known work and one of the finest settings of this sorrowful song to Mary at the Crucifixion. A hidden gem in this concert is Handel’s cantata ‘Ah! che troppo ineguali’, an anguished appeal of mortal voices to Mary to extinguish every spark of warlike fury and bring peace - it is paired here with the altogether earthier cantata Il Duello Amoroso. Almost a mini-opera, it tells the sotry of an 'amorous duel' between the shepherd daliso and the shepherdess Amaryllis, the music perfectly capturing the drama of the story. 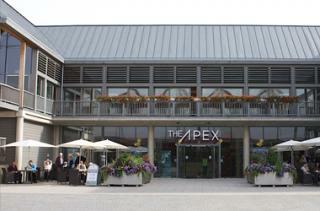 The Academy of Ancient Music play at The Apex on Thursday 23 February at 7.30pm. Tickets are £27 & £22, with £5 tickets for those aged under 25.